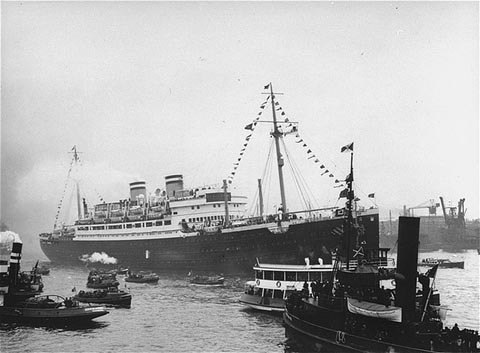 On May 13, 1939, the Hamburg-Amerika Line ocean liner SS St. Louis departed Hamburg, Germany for Havana, Cuba. Aboard the St. Louis were more than 930 Jewish refugees seeking refuge in Cuba from Nazi oppression. The refugees had secured legitimate landing certificates for Cuba, however, upon their arrival the refugees learned that the pro-fascist Cuban government had invalidated the visas and all but 27 of the refugees were denied entry. Much like White Russians after the 1917 Revolution, the refugees were now a people without a country. The refugees sought entry into the United States, but in a shameful and cowardly act, the US government denied them access. Thus, on June 6 the St. Louis was forced to return to Europe where the refugees were eventually divvied up among several European countries – 287 to the United Kingdom, 214 to Belgium, 224 to France and 181 to the Netherlands. As the Nazi juggernaut flattened Europe over the next 18 months many of the refugees once again found themselves under the heel of the Nazi jackboot. Many of the refugees perished in the Holocaust, however, a majority were able to survive the war. In the subsequent years, the plight of the refugees aboard the St. Louis has been highlighted in print (Refuge Denied & Voyage of the Damned ) and the big screen (Voyage of the Damned ). As the great statesman Edmund Burke once said, “The only thing necessary for the triumph of evil is for good men to do nothing.” Sadly, good men chose to do nothing when the refugees aboard the St. Louis came calling in Cuba and the United States.